I’ve recently bought myself a new road bike with disc brakes. It won’t be replacing my beloved carbon road bikes (yes I have two of them) which have caliper brakes but it will suit another purpose – commuting to work, short trips here and there, and maybe even some off-road riding. 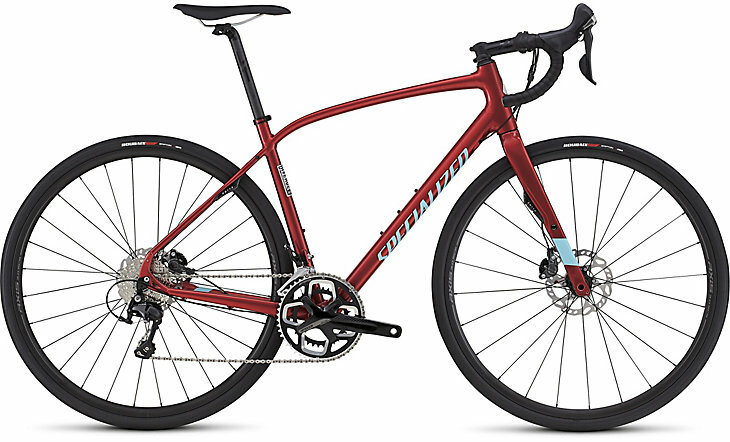 I chose to buy the Specialized Diverge because it has the ‘go anywhere’ capability and while I’ve only ridden it once I’m already in love. The hydraulic disc brakes are probably the biggest difference this bike has with my others so I thought it was worth a blog post to outline what the future might hold for disc brakes on road bikes. The disc brakes have a really firm feeling about them. By way of comparison my five year old road bike has Ultegra brakes, and my year old road bike has Dura Ace brakes, and the Dura Ace ones are significantly better than the old Ultegra brakes. The disc brakes feel just that bit more responsive and solid that the Dura Ace. In my experience female riders are a little more risk averse than their male counterparts, particularly on long descents, so I think disc brakes on road bikes are going to suit a lot of female road riders. So what’s the future of disc brakes….The UCI recently announced that it will continue to test the use of disc brakes in 2016, with men and women professional riders allowed to use the new braking technology in races from 1 January 2016. A smaller amount of testing took place this year and if this wider phase of testing is a success, disc brakes will officially become legal across the sport from 2017. Not all the details of the second phase of testing have been announced but it’s thought that the UCI will permit every rider in a team to use disc brakes in 2016 and in every major race. This is expected to spark widespread use of disc brakes during the 2016 season. I understand that this means from 2017 anyone racing around the world including at club level will be able to use disc brakes, and this will see them in widespread use. The benefits you can expect from disc brakes include more power, better modulation and all-weather ability. Disc brakes, and especially hydraulic disc brakes, do provide substantially more stopping power than rim brakes. Modulation refers to the ‘feel’ coming through the brake system as a rider applies and releases pressure on the levers. Disc brakes do offer better modulation than rim brakes. The biggest benefit for everyday riders is the all-weather ability that disc brakes provide. Rims and calipers are a hugely compromised system in the wet, while disc brakes offer very constant performance in all conditions. A number of bike manufacturers have been quietly working behind the scenes developing new models to be ready for the UCI changes. Specialized seems to be ahead of the pack with women specific road bikes fitted with disc brakes. In Australia there are eight models in the Ruby range (endurance road bikes) and three of those have hydraulic disc brakes including the high-spec Ruby Pro Disc UDi2 which is $8,999. In the Dolce range they have one disc model, the Dolce Comp Evo for $2,999. I couldn’t find too many other women’s road bikes except Giant which has them fitted to its Avail range. If like me you own multiple bikes you can own your own disc brake road bike right now and still have a caliper brake bike for racing. If it’s your only bike then don’t rush out and buy a disc model if you’re planning to race. I’d love to hear from female road riders about their experience with disc brakes. Comments here and on Facebook are most welcome. Next Post:What should I buy a female roadie for Christmas in 2015?